Rawlins and Madley was established as a partnership in 1991 following a buyback from Black Horse Agencies. In May 2008 the practice converted to Limited Liability Partnership (LLP) status. 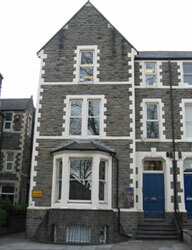 The LLP comprises two members Jeremy Rawlins and Paul Madley with their offices located in the centre of Cardiff. The firm operates as a general practice specialising in the sale, acquisition and appraisal of residential land and development opportunities throughout the southern half of Wales and is recognised amongst their peers for such expertise. In addition advice is offered to clients on general practice matters including commercial agency, Landlord and Tenant, valuations and compensation. Prior to the establishment of the practice the partners worked together at Black Horse Agencies and before that at Cooke & Arkwright. Jeremy and Paul have more than 50 years combined experience as Chartered Surveyors operating in South Wales which has enabled them to establish a wide knowledge of the South Wales property market with particular relevance to their specialism in residential development land opportunities coupled with an extensive client base. The practice prides itself on the close, hands on working relationship it enjoys with their clients and their ability to offer professional practical advice. Educated at the Cathedral School, Llandaff, Jeremy went on to Hurstpierpoint College Sussex, before graduating from the Royal Agricultural College, Cirencester in 1977 and qualifying as a Chartered Surveyor in 1981. Jeremy became a Fellow of the Institution in 1988 and served on the RICS Governing Council for many years. Jeremy was a partner in the firm of Cooke & Arkwright prior to the sale to Black Horse Agencies, and ran the South Wales Land Department for BHA up to the buy back in 1991. He enjoys playing golf and cricket and lives in the Vale of Glamorgan. Also educated at the Cathedral School, Llandaff and Sherborne School, Dorset Paul graduated from The Royal Agricultural College, Cirencester in 1981 and qualified as a Chartered Surveyor in 1983. He became a Fellow of the RICS in 1994. A second generation Chartered Surveyor he has followed in his late father?s footsteps who established the well respected estate agency practice of Lucas and Madley in the 1950's. The majority of his professional life has been spent in South Wales and prior to setting up rawlins and madley worked with Cooke & Arkwright in their Cardiff, Bridgend, Swansea and Pembroke offices. A keen sportsman in his playing days with St Fagans Cricket Club and Llandaff Rugby Club.